The "Museo de las Ferias" (Fair Museum?) in Medina del Campo (Province of Valladolid, Castile and Leon, Spain) keeps the "Pendon Real de Castilla," made in 1666 for the coronation of King Charles II. 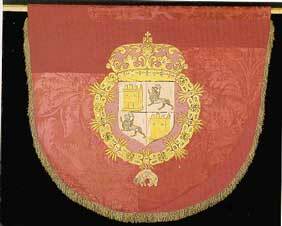 The shield of Castille placed in the middle of the pennant dates form the XVIth century. According to Armando Represa, this pennant is "a rare example of authentic flags from the XVIth century" (El pendón de Castilla y otras consideraciones sobre el reino. Valladolid, 1983, p.19). The pennant was specifically made for the ceremony of coronation who took place in Medina del Campo on 1 February 1666. The pennant was recently restored (1997-1998). This is a very brief outline of the information given in Spanish on the Museum's website. The site seems to include interesting information on the traditional ceremony of coronation of the kings of Spain and the use of pennants during this ceremony. Unfortunately, my knowledge of Spanish is too fragmentary to allow me to understand the details of the text. I'll let our Spanish friends do some homework and tell us what is worth being mentioned.